We were not sorry to leave Caransebes, a town of few delights, and the only place we have been to that had no outdoor cafe. It transpired that no train service existed to Hateg and our only option was to ride there. We had received advice that the traffic wasn’t too bad. At about 10km along the road, Ian experienced a sense of curiosity about the location of his wallet and sensibly decided to stop and check. He examined the contents of all four panniers without luck. He then re-examined all panniers – still no luck, this despite a habit of rigorous inspection before leaving our lodgings. This is the experience that travellers dread – the possible loss of an essential item. Bicycle travellers dread also the prospect of backtracking as it goes against all instincts to waste effort needlessly -especially on a potentially futile errand along an unpleasant road back to a vile city. Before giving way to despair, another search was done and the wallet was there. That was a good moment. We breakfasted another 10km along in Otelu Rosu, where there was a supermarket and a town market. Our route took us along a gradual climb through farmland in an area that is more intensively farmed than we have seen so far. It was quite beautiful with corn fields, orchards, roadside apple and walnut trees, conical hay stacks and neat villages with flowers on the verges. The scythe is being put to good use in rural Romania. We saw people scything paddocks of grass and raking fields by hand. A couple of times we saw men cycling along with a scythe on the rear carrier. Somehow, though, I don’t think that the younger generation will be scything as much as the older. Another unusual sight was a horse drawn cart (we have seen a few of these) with a load of cut grass. The most unusual sight was a dead horse on the roadside in a village, we think hit by a car. It was refreshing and spirit-lifting to see this area, surrounded by hills and with towering mountains on the horizon, and to be away from the direness of the towns. At the top of the climb (600m) we stopped to rest. 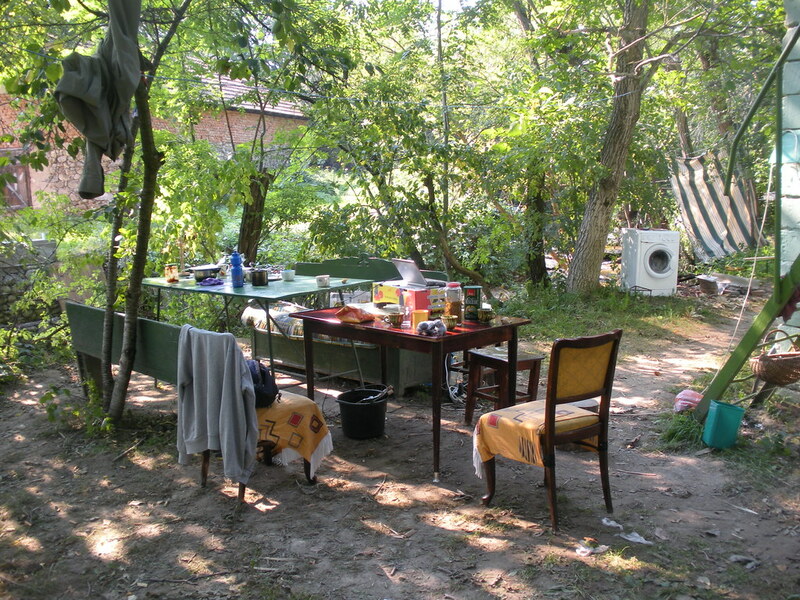 And an old wrinkled woman with head scarf was sitting there, no house or other habitation nearby. Her name was Ida, aged 77, Hungarian, no English of course, very sad because of tragedies in her life, greeting us and saying prayers in Latin. Roman ruins were by the roadside further down the other side, nicely and neatly preserved with concrete holding the old stones in place. Probably not archaeology best practice but good for a tourist stop. We bought supplies in Hateg for a couple of days off the beaten track. We are in the small village of Salasu de Sus with Mihai, a couchsurfing host and friend of Raul. He has open house here for couchsurfing and travellers. It is a simple setup here with a one room house filled with couches, stream beside the house for washing and long drop toilet out the back. Kazu, a Japanese CS is here too. This entry was posted on 25 August 2010 at 1:30 pm and is filed under Romania. You can follow any responses to this entry through the RSS 2.0 feed. You can leave a response, or trackback from your own site.